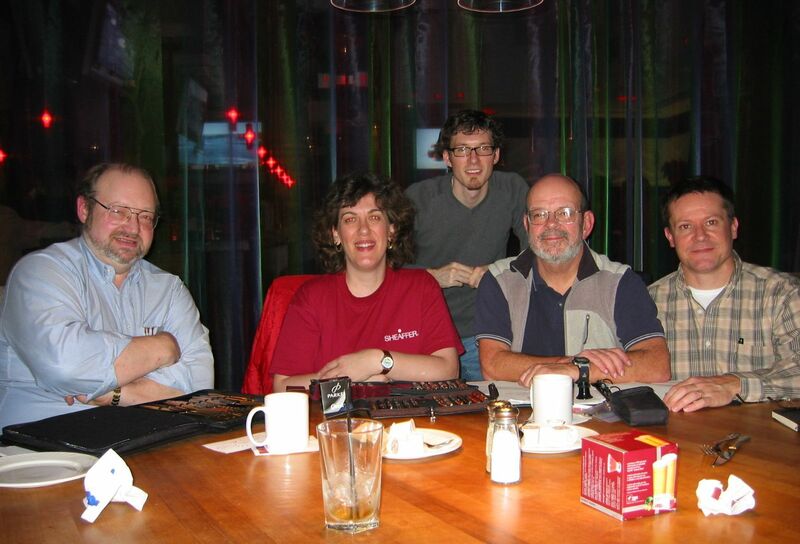 The Vancouver Pen Club was started by Tim Conklin, who posted a query on the Zoss List back on October 1, 2006 asking if there were any people in the Vancouver, B.C. area who were interested in forming a local pen club. I missed this post, but saw a later (Nov. 2) Zoss post by Tim, whose subject line was "Announcing the Vancouver Pen Club". I think there were only a couple of members at this point (Tim and his fellow swim club member Bill K.) but at least they were off to a start! My pen friend Brian asked if I was interested in joining, so both he and I wrote to Tim, informing him of our interest. I told Ryan I. (who was also on the Fountain Pen Network, as was original member Bill S.) about the club, and the first meeting was set for December 7, 2006 at Moxie's Classic Grill, a restaurant in Vancouver's West End. Five of us showed up that night (Brian had just flown back from a trip to Europe and couldn't make it) and we were shown to a very large circular table (with a privacy curtain, no less!) near the front of the restaurant. With the dance music blaring in the background, we managed to introduce ourselves and talked about our love of fountain pens and how we came to be fountain pen users and/or collectors. I don't remember what I ate that night, but I will never forget how friendly and welcoming everyone was. From that date, our club has grown by leaps and bounds and now has over 90 people on our membership list. I hope that some of you reading this will be inspired to start your own local pen club; it's not as difficult as you might think. Many thanks to Tim for taking the initiative to start this wonderful pen club; hope you can make it to another meeting soon, Tim---we miss you! Wonderful write-up Maja - thanks for that, and it sure takes me back to the origins of our club which you run with such inspiration. Just a note on how Tim and myself got the idea rolling: yes we were both swimming with the Vancouver Open Water Swim Association. Having a beer after one swim practice at Kits Beach, Tim had to write something, and produced a fountain pen. I thought - who the heck takes a fountain pen to a swim practice on the beach? Well Tim did, and he had about two more with him in his swim bag I think. We talked about how we loved using fountain pens, and it just rolled from there. Bill K.
Hi Bill, thank you for the kind words, and also for filling in the blanks re: how the club started. Fountain pens are certainly not very commonly used nowdays, so I can understand why the pen caught your eye, esp. on a beach! Thanks for all your advice and contributions to our club over the years, Bill! Gosh Maja! I can't believe that was six years ago. As I think back to 2006, I remember really enjoying everything about my fountain pens, including the ink I was using and the paper I was writing on. But it felt a bit lonely because I didn't have anyone with whom I could share my enthusiasm. The Zoss Pen List was my outlet then. Bill remarked peculiar it seemed for a guy to have brought three fountain pens to the beach for swim practice. And to me, it seemed perfectly natural. I mean, what else would I have brought -- a common ball-point pen? Certainly not. I do remember that event though, and I was so happy to meet another real live flesh & blood human being who shared my interest in fountain pens. And I believe Bill shared with me the Parker fountain pen he had received as a gift from his work. When I met Maja, my pen world just opened up. I'd never met anybody with such a vast collection of fountain pens before. She was a veteran, and I learned so much from her. Her enthusiasm and charm alone brought me to many meetings, and she helped me organize the club and create agendas and meeting themes. I am so very grateful to Richard of Perk's Pens for opening his doors, keeping his store open for us to meet. He's given me rides home on wet November evenings after our pen club meetings. I think that the VPC has become a real thriving community of pen enthusiasts in the Lower Mainland. We are indeed a strong and vibrant group to which I'm proud to belong. Hi Tim! How great to hear from you! Thank you very much for the compliments; running the club since you left has truly been a labour of love for me...and the time has just flown---I can't believe it's been six years either! We are forever in your debt for boldly taking the plunge (pun intended ;) and creating the Vancouver Pen Club. We look forward to seeing you (and thanking you) in person next Thursday June 21st at Perks!